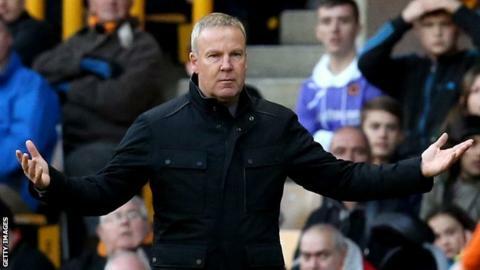 Head coach Kenny Jackett has said he "has no ambition" to leave Wolves after being linked with the managerial vacancy at Championship rivals QPR. Former Rs striker Kevin Gallen, brother of Jackett's Molineux assistant Joe, said the 53-year-old would be ideal to replace the sacked Chris Ramsey. Jackett spent three years as assistant manager to Ian Holloway at Loftus Road between 2001 and 2004. But he told BBC WM 95.6: "I'm happy here, I'm committed to Wolves." Jackett added: "It's a great club and the way things are you do the job at a club like this until someone tells you different." Former Rangers boss Neil Warnock, who had been acting as an advisor at Loftus Road, is currently in temporary charge and oversaw Saturday's goalless draw with Preston. Wolves also finished goalless against third-placed Burnley and are currently 14th in the Championship after a run of one win in six games. But Jackett, who is in his third season at Molineux, said there were signs of improvement against the Clarets. "We've conceded one goal in three games, and with Mike Williamson coming in [on loan from Newcastle], his physical presence has really helped us," he said. "We want to be winning games, but we've got four points out of nine from the last three games and one goal against. "Ultimately, we're always looking to do better and try to push up the table."